Restoring Antiques of today, using materials & techniques of the past, for generations of the future. Our approach to the restoration of your antiques is simple. We want them to come back to you looking like they have been loved, maintained and used throughout their life. What we don’t want is for them to come back looking brand new. It is imperative that we preserve the patination and as a result, the integrity and value of the piece. Let’s suppose you have a chair which is loose in the leg joints, has a sizeable chuck of timber missing from a rail, has dints, bruises and scratches all over and a finish which has seen better days. How would we approach it? Firstly, we would need to dismantle the chair at all the joints. Then we need to clean out the joints of the old animal glue and reglue using fresh animal glue. Why animal glue? Because it is reversible (unlike modern glues). This means it can be dismantled again in the future. We call this sympathetic restoration. Next we would look at the sizeable chunk of timber missing. If it were small we would probably leave it. A large eyesore however needs to be repaired sympathetically. We would source a piece of the same species of timber, trying to match grain as best we can. We would hand carve it to the missing shape and glue it into position. We also call this sympathetic restoration. We would then look at the timber surface and decide whether we can salvage the surface. This is very important if it still has its original surface. It may just need a good clean, revive and wax. We call this CONSERVATION. It may however be a non-original finish, or a finish that cannot be salvaged. In this situation we would hand strip the polish and very lightly sand the surface by hand just to ‘soften it’ – not to remove all dints and bruises. We would never use an electric sander on an antique because they are just too aggressive and remove the valuable patina. This too is called CONSERVATION. Now we would decide whether we need to stain the chair and if so we would generally use water stains – these are less likely to fade than modern stains. We also use Earth pigments for small touch ups. Next we would refinish the chair using the same materials and techniques as what would have originally been used. This may be a shellac (French Polished) finish or a wax finish. 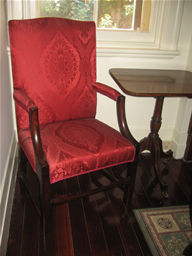 Hence we have restored the antique chair sympathetically and conserved the patina. We are very passionate about antiques. Our view is that people who have them in their possession are merely ‘custodians’ until they are sold or passed onto the next ‘custodian’. Hence it is each persons responsibility to treat these items with the respect that they deserve so that future generations may also enjoy them. As they say in the classics……”they don’t make em like that any more”…………..